Whenever I go rogue on a recipe, Rob and I are a bit nervous. It usually ends with Rob having to coming in a save the day (he's my secret weapon in the kitchen!). But, with this recipe, I didn't need him. 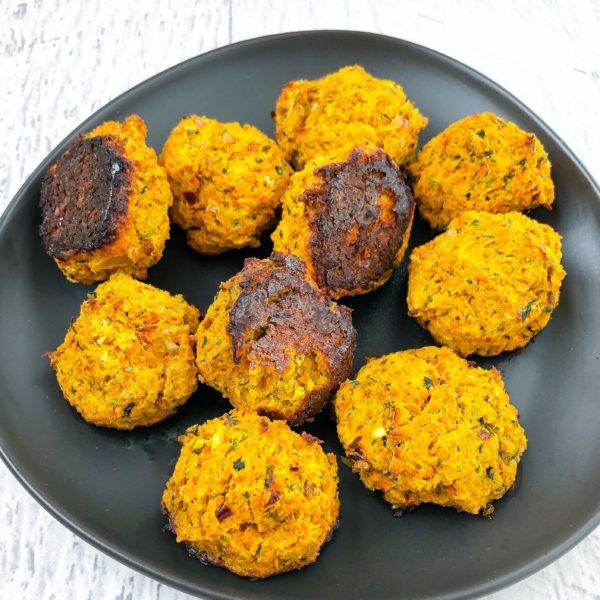 These chickpea and carrot meatballs are going to be a staple in the meal prep rotation for sure. They are filled with plant based protein from the chickpeas and high quality animal protein from the eggs, and tons of vegetables. The carrots steal the show by bringing a slightly sweet flavor and divine texture. YOU'RE GOING TO LOVE THESE. Enjoy them with some pasta, on a salad, or on their own as a snack. Of course, I purchased the ingredients during one of my SHOP NAKED trips. (Check out this post to learn more about my shop naked philosophy). I use the term SHOP NAKED to describe how I go grocery shopping- I try to only purchase my produce and staples "naked," meaning plastic and package free. Start by grating the carrots and chopping the onions. (I use my food processor to do both!). Rinse the canned chickpeas under cold water and add them to the food processor along with all the other ingredients. (If your food processor is too small, divide and make this in two batches). Add a drizzle of avocado oil to the baking sheet and then take small handfuls of the mixture and shape them into the meatballs. The mixture is a bit wet, but you should be able to easily make the balls. Place on the baking sheet with a bit of room between each. Bake in the over at 425F for about 30 minutes until cooked through. Take a deep breath before enjoying with pasta, on a salad, or on their own.